Western blot analysis of extracts from HeLa cells using Phospho-eIF4B (Ser422) Antibody (upper) or eIF4B Antibody #3592 (lower). 48 hours following siRNA transfection, cells were treated with Rapamycin (50 nM) and U0126 (10 µM) as indicated. 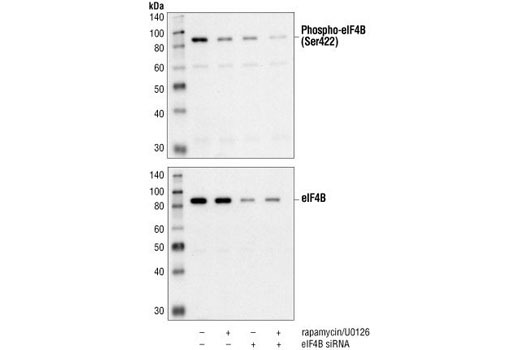 Phospho-eIF4B (Ser422) Antibody detects eIF4B only when phosphorylated at Ser422. Polyclonal antibodies are produced by immunizing animals with a synthetic phosphopeptide corresponding to residues surrounding Ser422 of human eIF4B. Antibodies are purified by protein A and peptide affinity chromatography. p70 S6 Kinase has been shown to phosphorylate eIF4B at the rapamycin-sensitive site Ser422 in vivo, and a Ser422Ala mutant of eIF4B shows deminished activity in an in vitro translation assay (7). Raught, B. et al. (2004) EMBO J 23, 1761-9.